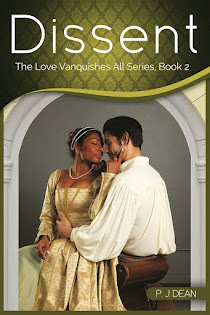 diverse views: Isn't romance for everyone? a blog/forum from the desk of author, P. J. Dean, primarily for promoting her latest releases, for discussing romance writing and that curious niche christened "multicultural." Tea will be sipped and occasionally spilled about the irrational, racial and religious WTFery that goes on in the industry. Related "multicultural" stateside doings will be highlighted too. This is a little video to showcase that thing I do - WRITE! This pretty graphic honors my historical romance, DISSENT. Mr. Huggins did a spot on job with the images and even piqued my interest in the story. And I wrote the damned thing!